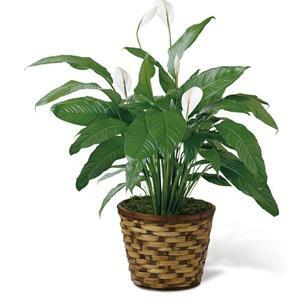 Spathiphyllum, or more commonly known as the Peace Lily, is a beautiful plant to help convey your wishes for tranquility and sweet serenity. An ideal gift for most occasions, this lush plant displays white conical blooms perfectly presented in a round woven container to make it a natural fit for any interior decor. 8 plant.